Athlete360 is a online community of athletes with an intuitive event calendar and simple event registration. You'll find great features like blogging and notifications to keep you motivated about your sport. Join today and get involved! With our easy-to-use event calendar, you can quickly submit information about events in your area. If we don't have an event in your area on our calendar, add it now! We know you've been jonesin for more Athlete360 while you're on the bus ride home from your nine-to-fiver. Now you can get your endurance fix on your iPhone or Android phone! Event organizers, we have good news! 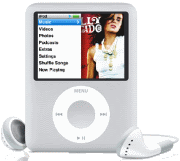 We've decided to extend our iPod giveaway through 2010. Set up an event with us where at least 1000 participants register through Athlete360.com and we'll give away an iPod at the start of your event! What better way to kick things off?! We love free swag and we know your participants will too! Give us a call and set up your event today. Athlete360 offers the most intuitive event management tools in the industry. Complete web site and credit card processing solution! We'll host your site and manage registration for your event end-to-end. Competitive rates save your attendees money and keep them coming back for more. We're spam free! When a user is registering for your event they see no ads, just your event. Flexible event tools allow you to easily create multi race and series discounts. Give us a call at 208-918-1650 and we'll have you set up within minutes.